We were on our way back from a bike ride when we came across FRÍO Gelato (517 Dempster St, Evanston, IL 60201), an answer to our secret hopes for a cold treat. We are always up for gelato, and FRÍO does gelato with an Argentine twist. Gelato is huge in Argentina, due to the massive Italian immigration to the country. We remarked upon a mysterious (long gone) Argentine ice cream store in Chicago many years ago, so short of a trip to Argentina, we were excited to try some Argentine icy treats. Alongside the typical gelato flavors you might expect, there was also dulce de leche, avocado and malbec. You can also get fresh-fruit sorbet flavors, tasty coffee drinks and the classic Argentine mate drink. We were there for gelato, however, so we sampled the dulce de leche and the marsala wine sambayon, an Argentine riff on zabaglione, an Italian custard desert. The gelato was light and creamy, with bold flavors. Though it tasted pretty similar to the Italian-style gelato we’ve had, we really appreciated the fresh ingredients and unique flavor combinations on offer at FRÍO. Plus, if you really want a unique Argentine spin on dessert you can get the gelato between two alfajor cookies! We are all about the ice cream treats from all over the world. One that has caught our eye is Thai rolled ice cream, which looks unlike anything we have ever seen! Plus, it is a perfect way to celebrate Thai New Year, Songkran. Thai rolled ice cream is made by spreading ice cream and fillings on a round cold plate, where it is then re-frozen and rolled up into the signature shape. Thai rolled ice cream is now finding its way onto restaurant menus across the US, with Thai-style rolled ice cream joints opening up in NYC, Philly and LA. Has it made its way to your city yet? We can’t wait to try it in Cleveland or Chicago! Before moving here, we had no idea that Cleveland was such a big ice cream town. There are more ice cream places in Cleveland than there are doughnut shops in Chicago (at least it seems like it). 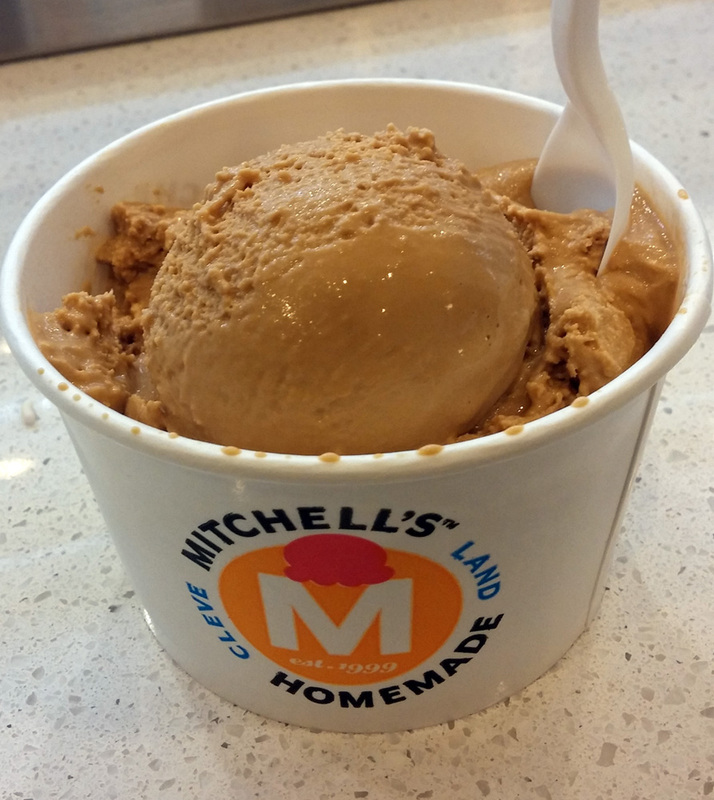 We ate at a variety of ice cream places around town to find our favorite, and of course “best” is subjective, but we think we have landed on a winner: Mitchell’s. We fell in love with Mitchell’s due to their wide variety of flavors, consistently creamy texture and fresh ingredients. They even make the waffle cones right in front of you! On the face of it Mitchell’s looks like a typical ice cream store with a wide selection. Along with scoops in a cup or cone, you can also make special sundaes, shakes, malts and floats (plus pints and other treats to take home). However, the major difference is the taste. We were blown away by the first two flavors we tried: Salted Caramel and Mint chocolate chip. First off, the mint chocolate chip was NOT green, and it tasted like fresh mint leaves, the caramel was creamy and salty, and not at all overpowering. Other flavors like Key Lime Pie perfectly replicated their real life inspirations. There are even vegan ice creams and frozen yogurts if you are so inclined. Personally, I see a Mitchell’s ice cream cake in our future birthday plans. We aim to try every flavor they have, currently about 25 regular varieties. There are also seasonal flavors to enjoy, making use of Ohio’s local produce, so there will always be something new (current seasonal flavors include caramelized chocolate, fresh peach and coconut, among others). There are eight Mitchell’s stores now in Cleveland, but our favorite is in the Ohio City neighborhood (located at: 1867 W 25th St, Cleveland, OH 44113), for three important reasons: 1. It is in a converted movie theater; 2. It is the factory where they make all of their ice cream (a process you can watch); 3. There is a miniature train running around the first floor. If you visit Cleveland, be sure to stop by! There is nothing better than cooling off on a warm day than with an icy treat! On 4th of July’s pasts we were partial to the classic Good Humor Chocolate Eclairs, but now we enjoy a wider variety of treats. If you live in Chicago, you are lucky enough to have a wide variety of international scoop shops serving up icy treats, especially Mexican paleterias. Our friend Nissa sent us this great link from Chicago Magazine about icy international treats in the city, representing India, Argentina and beyond. Now you will have no excuse not to have some sweet (cold) treats this weekend! Jeni’s Splendid Ice Creams now has two stores in the Chicago area – and we were super pumped to try the new Wicker Park location (1505 N. Milwaukee Ave., Chicago) when Spring-like weather finally arrived. Jeni’s is a Columbus-based ice creamery helmed by ice cream guru Jeni Britton Bauer that has been expanding across the US in the past few years. However, Jeni’s stores all across America have been closed for the past month due to a recall. Now they are all back open – just in time to get a summer ice cream fix. The key to Jeni’s success is high quality and unusual flavors (check out the menu below). Jeni’s Wicker park is right in the heart of the main drag on Milwaukee, and I get the impression they are busy ALL the time. When we arrived there was a line, but it moved pretty quickly, and we even were able to find a place to sit. One cool touch is that they make their own waffle cones right in front of you! There is a selection of “signature” flavors to choose from, including wildberry lavender (tastes like Froot Loops), Salted Caramel and sun-popped corn, as well as some limited-edition specials like creme brulee and blue buttermilk frozen yogurt. There are even some local nods, with Intelligensia coffee-flavored ice cream or the option to get a scoop of any ice cream in a cup of Intelligensia coffee. You can get anywhere between one and four scoops, and we settled on a Trio. We sampled buttermilk orange frozen yogurt, the “Buckeye State” which is peanut butter ice cream with chocolate chips, and dark chocolate. We were happy with our flavor choices, and the peanut butter and buttermilk orange were standouts. We definitely recommend Jeni’s for a summer treat and we are excited to see what creative flavor Jeni comes up with next. Yesterday I had my first paleta in Chicago – spring is officially here! San Francisco is lucky enough to have better weather year-round, and maybe that is the reason it has such a huge artisanal ice cream scene, which we can totally get behind. We wanted to try at least one ice cream shop when here, and Bi-Rite Creamery (3692 18TH ST.) came particularly highly recommended. Bi-Rite was an oasis of ice cream in a pretty residential neighborhood of the Mission, and we knew we were in the right place when we saw the red neon sign and the big line! The store itself was tiny, and had a line snaking out the door, even at about 7 pm on a Thursday. Bi-Rite is known for its unusual flavors, and has its list of both classic and seasonal flavors posted outside, so you can think about your choice when you wait. I went with the much-lauded salted caramel and the Blue Bottle coffee flavor with almonds and chocolate chips. The classic flavors of honey lavender and Ricanelas cinnamon cookies were popular, and other tasty seasonal flavors included Creme Brulee, Orange Cardamom and Balsamic Strawberry. You can get your flavors in either a cup or cone and even in sundaes with clever names like the “Dainty Gentleman” which consists or honey lavender, sea salt and blood orange. You can also buy a variety of baked goods like rhubarb pie and cupcakes, ice cream cakes, ice cream sandwiches, Bi-Rite gear and pints to take home. There was a separate counter for soft serve, which was, at the time, empty. Later, we come to find out that they were serving buffalo milk soft serve! Maybe next time… There is also a Bi-Rite gourmet/natural food market just a block away, if you can’t get enough artisanal cuteness. We wish we lived closer to Bi-Rite so we could sample all of the flavors, especially a signature sundae. It’s St. Patrick’s Day, so it’s time for another Irish treat – the 99. But what in the world is a 99? A typical 99 is vanilla softserve served in a cone, and topped with a piece of Cadbury Flake chocolate. Each of these elements has to be present for it to be a true 99. 99s have been around since at least the 1930s, when a special, shorter version of the Flake bar was introduced as a “99 Flake.” But where does the name come from? No one is quite sure, but this short documentary on the 99 provides some theories. 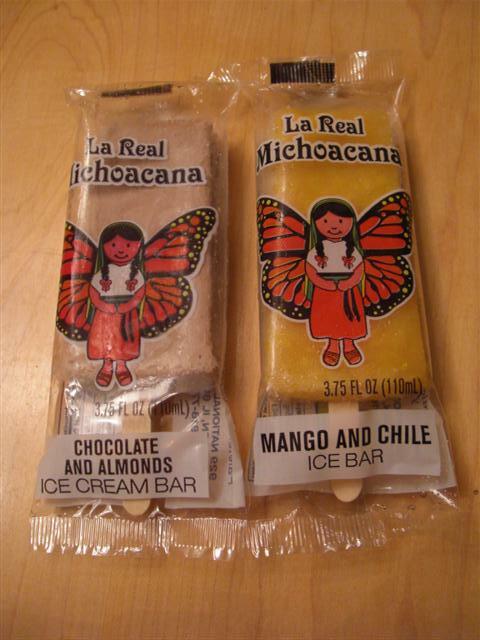 One of our go-to places for a cool summer treat is Palateria La Monarca in Rogers Park (6955 N. Clark) – we usually get the lime and mango paletas. However, there are a whole variety of Mexican Paleterias (popsicle shops) and Neverias (Ice cream stores) throughout Chicago that we have not yet tried. Even just on the stretch of North Clark near Monarca we noticed a few new ice cream places popping up, including Las Delicias de Michoacan (6649 N. Clark). However, shops aren’t just popping up on North Clark – it is a city-wide phenomenon! WBEZ’ Monica Eng has an article about the proliferation of Mexican ice cream shops, and more than a few recommendations of places/treats to try. In particular, Eng recommends the mangonada, a neveria staple of mango sorbet topped with mango slices and a sweet and salty pickled fruit sauce called chamoy. The mangonada is now on our summer bucket list. What’s your favorite thing to order at a Neveria or Paleteria? So obviously we are going to be obsessed with any ice cream store that is named in homage to Celia Cruz’s signature phrase and has seats made from guayabera shirts. Azucar Ice Cream (1503 SW 8th St., Miami, FL) is all that and more – and the ice cream is more than good! There is a huge list of flavors written on the chalkboard wall, but only a portion are usually on offer. The flavors that stand out are the tropical varieties: plantain, Cuban coffee and mango, etc., and of course Abuela Maria! This flavor consists of Maria sugar cookies (apparently found all over the world in various forms), cream cheese and a guava swirl. We instantly fell in love. It was just like eating a guava cheesecake; absolutely wonderful. This flavor in particular seemed to be so popular that we saw it on offer at several other restaurants throughout the city. If you are in Miami you have to try it! So as any fair-weather reader of this blog knows, we love ice cream, whether in hot or cold weather. This attitude is shared, perhaps unsurprisingly, by Russians, who enjoy ice cream year round. A recent Culture article on Russian ice cream, or morozhenoe, clued us in to this international ice cream we knew next to nothing about! Apparently Morozhenoe is served slightly soft, and has a creamier texture than US ice cream. If this piques your interest, you can try your hand at making your own Russian-style ice cream. In honor of National Ice Cream Month, here’s another post about one of our favorite topics. We here at ETW are huge fans of ice cream, but it takes a lot to wow us. Village Creamery, is one place we were pretty impressed by, and the sheer variety of unique flavors was a real treat. Many are inspired by Filipino flavors such as Mangosteen and Lychee and others by American treats, such as those made with Girl Scout cookies or Donut pieces. The variety is truly astounding. If you don’t believe us, check out this complete flavor list on their website. Of course if you are in the mood for a more simple Vanilla or Mint Chocolate chip, Village Creamery has those, too. 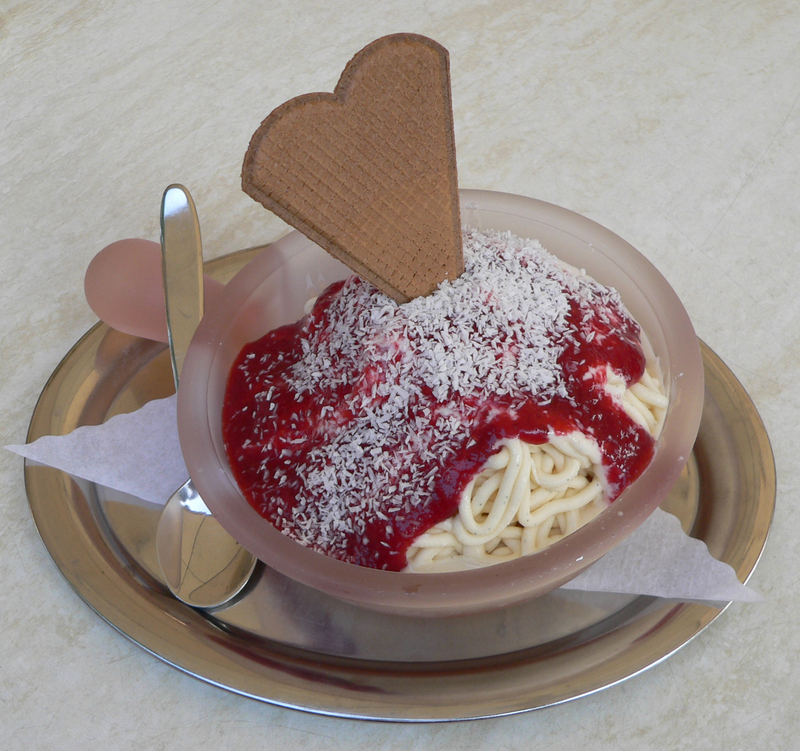 All of the ice creams are home made and the rotation of flavors varies from day to day. On the day we visited they had such eclectic flavors as Cheese (! ), Crème brulee, Durian, Jackfruit and Halo-Halo Fiesta, a riff on a popular Filipino dessert. We figured the halo-halo was a good choice, so we ordered one cup, along with a cup of the more typical Mint Chip. The Halo Halo flavor consisted of vanilla ice cream with banana, pineapple gel, coconut gel, red beans, white beans, and Rice Krispies. Though the combination seems quite unusual, it really worked. Our friends that ordered more traditional flavors were also pleased. 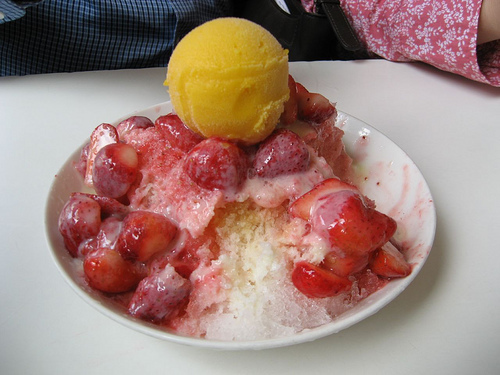 Along with simple scoops, Village Creamery also offers a range of sundaes, milkshakes, malts and even bubble tea. We highly recommend Village Creamery for your more idiosyncratic ice cream cravings and it is one of our favorite places in the burbs for a treat (there is also a location in Niles). It’s no secret we are huge fans of ice cream, gelato and paletas, and we are happy when a new place for these treats opens up in Chicago. But the latest place for ice cream in Chicago fills a different (and new) international niche: Cone, an Irish ice cream shop in the West Loop (1047 W Madison St.). Until now, we never associated Ireland with ice cream, though the country’s well-known cheese and butter products, in addition to a growing dairy industry, should have given us a clue. Cone is run by Irish expat Sean McGuire, and features all locally-made ice cream. McGuire’s menu highlights some classic Irish flavors, like Guinness and Jameson, while still providing the more typical mint and Oreo, among others. The store sells some Irish candy and beverages. Though Cone may seem unusual, we shouldn’t be surprised to see Irish ice cream: it turns out Irish citizens are among the top 10 consumers of ice cream a year, even beating out Italy.